What others have to say about Veronica Pullen…..
“When I initially applied to be mentored by Veronica, I knew I wanted to break out from being a local business owner but I didn’t see how I could leverage my knowledge and move from a situation where I was always exchanging time for money. During our first call, Veronica listened to all of my ideas, and helped me sketch out a plan for how I could bring my dream for an online business to life and at the end of the call, it was a no-brainer for me to say yes to her invitation to work with her and I’m so glad I did. She has transformed my business! I now know my niche, and I have a signature system so my ideal clients can see exactly how I can help them. I’ve published an eBook that several hundred people have downloaded and I hosted my first ever webinar to launch my dog training information product. 200 people registered for the webinar, and during the first week of sales for my info product I made £2,400! When I first starting working with V, I had no list, and I’d never heard of a webinar! My business has changed completely! She’s a genius when it comes to helping business people leverage what they already know so you can help more people and break out of being just a ‘local’ business owner! “Veronica – Your knowledge and support has been invaluable and I would not have been able to create a product in such a short space of time if it wasn’t for you.” Dominic Hodgson, The Dastardly Dog Trainer. 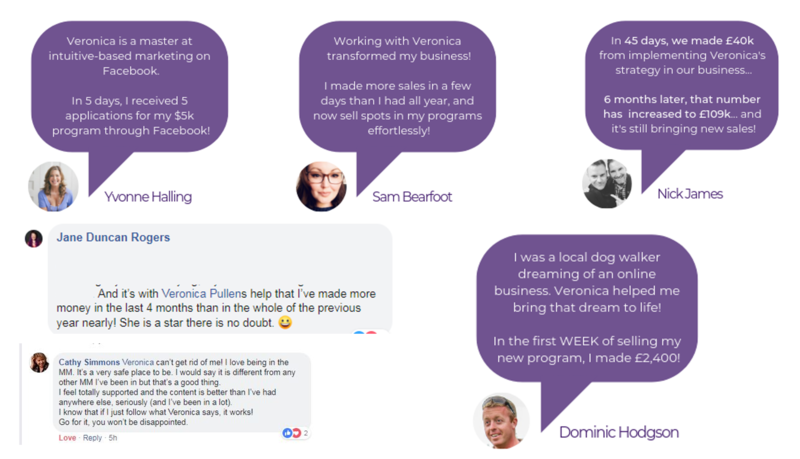 “Veronica is absolutely doing her ‘Thing’ when she helps you create and nurture social media relationships. She gets how to use social media to connect with your market so your business benefits in more ways than sales.